Few saints’ days are more widely celebrated throughout the world than March 17, the feast of St. Patrick. No literary date is commemorated more widely than June 16, Bloomsday, which marks the day in 1904 on which the fictional events of James Joyce’s Ulysses unfolded. Both days are major fixtures in Irish cultural life. St. Patrick’s Day is firmly ensconced as the big party day in the Irish national calendar (and there are no signs of anyone abandoning that cherished tradition), but Bloomsday is steadily growing in popularity. With each succeeding year it garners more publicity and draws greater numbers. 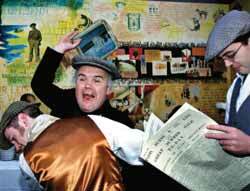 On June 16, devotees will once again don period costumes and re-enact scenes from Ulysses all across Dublin. There will be innumerable public readings from Joyce’s masterpiece, and many revelers will stop for a drink in one of the pubs immortalized in the sprawling novel. Bloomsday attracts the Irish because they are inveterate storytellers, and Ulysses is the tallest tale of them all, a multilayered and bewildering novel about Leopold Bloom’s daylong walk around Dublin, during which nothing much happens. Even those who enthusiastically take part in the celebrations are not sure whether Joyce was really onto something great or merely providing endless fodder for future university professors with the ultimate shaggy-dog story, a novel full of terribly clever and thoroughly mystifying accounts that culminate in Molly Bloom’s endless yarn of a monologue, which frustrates all our yearnings for a neat and tidy ending. Despite huge differences between the real person Patrick and the fictional character Bloom, both share the status of outsiders. For too long the Irish conveniently overlooked the fact that Patrick was English. But now that the newly moneyed Irish feel they have finally arrived, they are no longer so threatened by the realization that they owe their faith to someone from England. (Not that Christianity is something the secularized Irish pay much attention to these days.) Likewise, Leopold Bloom is the son of a Hungarian Jewish immigrant father, and although twice baptized, both as a Catholic and a Protestant, Bloom’s cultural Jewishness makes him feel a constant outsider throughout the novel. Both Patrick and Bloom are so remote that the Irish can be tempted simply to use them as another excuse to party. Yet ideally we are meant to hear from saints and great literary creations the radical summons issued at the end of Rilke’s poem “Archaic Torso of Apollo”: “You must change your life.” Of course, it can be difficult to be challenged by someone like Bloom, who never really existed in the first place. Even his Jewish identity in the novel is precarious, since he is uncircumcised and his mother is not Jewish. But the Irish people could benefit from allowing Leopold Bloom a more than folksy reality and from permitting this outsider to provoke reflection on the new Ireland that has emerged in recent decades. This does not mean holding up Leopold Bloom as a model to be imitated, since he is far from perfect, and there are aspects of his character that no sane person would want to emulate. But something about his status as an outsider can give today’s Irish fruit for reflection. It is no accident that James Joyce puts a man so uncertain of his standing at the heart of Ulysses. One reason for choosing Leopold Bloom may have been the fact that a Jewish “good Samaritan” named Alfred Hunter came to the rescue of Joyce himself when he was mugged in Dublin in 1904. Another reason was surely that Joyce was struck by parallels between the Jewish and Irish experience: persecution, a lost homeland, exile and a global diaspora. But probably the most significant reason was the 16-year period in which Joyce lived in Trieste, Italy, where he became friends with many members of the Jewish community, the most famous of them being Italo Svevo, whom Joyce took under his wing, championing this previously ignored writer. Leopold Bloom, whom Joyce affectionately portrays as the meekest and most caring of men, would not have been the kind of voice that anyone in the Ireland of 1904 would have taken seriously. With its huge tide of immigrants, today’s Ireland has multiple new voices, especially from such countries as Poland, Nigeria and Lithuania. In relation to its population, Ireland has the same proportion of immigrants as does the United States. So far in Ireland, there have been no signs of the discrimination and conflict that immigration has provoked in other European countries. But the native-born Irish still look on the new arrivals as outsiders. They are welcome as workers, but they are not seen as offering a serious contribution to the future of the country. Bloomsday is not just about the past; it has to do also with the Irish future. Each year it provides another opportunity for the Irish to begin a dialogue about the kind of Ireland they want to imagine and create. Ireland is composed of four provinces: Leinster, Ulster, Munster and Connaught. The Gaelic word for “province” literally means “fifth.” Building on this etymological curiosity, creative artists have coined the phrase “fifth province” to refer to the realm of the imagination. Leopold Bloom inhabits this fifth province of Ireland, an imaginative space that can help the real Irish enlarge the actual dimensions of their lives. For Leopold Bloom, being Jewish is not about law or ritual, nor is it expressed through religious affiliation. It is more about being inserted into a collective memory that gives him identity and assuages his feelings of social alienation with the knowledge that his ancestors were exiles as well. Force, hatred, history, all that. That’s not life for men and women, insult and hatred. And everybody knows that it’s the very opposite of that that is really life. No less than others, the Irish are tempted to label people who are different. They too are afraid of the other. Like the character Leopold Bloom, Ireland could make a stand in the world. Like Joyce, Ireland could enter a generous imaginative space and usher in new horizons. Like their most famous writer, the Irish could insist, despite the obstacles, on a future in which both self and others are affirmed, similar to the yes that resounds throughout Molly Bloom’s long soliloquy that marks the end of the novel. In this long stream of consciousness, which is also a stream of affirmation, Molly Bloom, this woman of Mediterranean origin whose mother was possibly Jewish, says yes to life, yes to otherness, yes to liberating possibilities. Has it been definitively established that St Patrick was born in England? I gathered that a variety of theses exists, including that he was born in either Wales or Scotland, none of which has been accepted as authoritative. Father Casey's piece is a itself a lovely testimony to the vibrancy of the fifth province, where artistic and religious imagination join. Would that we in this country were able to manage this blend better. Not that we're altogether bereft. Consider, for example, writers like J. F. Powers and Flannery O'Connor, theologians like William Lynch and David Tracy. But then they're Irish-Americans, which perhaps explains a fair amount. Professor Casey's essay about Mr. Bloom, set in Ireland, is beautiful and thoroughly Christian. Although I could never be a Roman Catholic, I celebrate this contribution that he has made to all of us on Planet Earth. Thank you, Professor Casey, for your faith-deepening contribution. Thomas G. Casey's assumption that "Bloomsday attracts the Irish because they are inveterate storytellers, and Ulysses is the tallest tale of all . . ." seems to be stretching the point. Most of the Irish know who James Joyce was but just how many of them read Ulysses? Or gotten past the second chapter? Imagine all these people (with few exceptions) celebrating a man and a masterpiece they do not understand and, consequently, cannot genuinely appreciate. But, hey, why not toast him with a Guinness at Barney Kiernan's anyway? That's a lovely article, but St.Patrick couldn't have been English, because there was no such place as England. He seems to have come from Roman Britain. It was the later Anglo-Saxon invasions which led to the development of "England". This article also appeared in print, under the headline "Ireland's Jewish Patron Saint," in the May 26, 2008 issue.